Come on Kevin! I know, I know, I’m slacking… I had time to make a blogpost yesterday but decided to just watch some Netflix and shut down my brain for a few hours. It was awesome! Well, time to put my brain Billie Branchboots back to work for a few weeks. No breaks allowed! This is the last small and short challenge of IBM’s Master The Mainframe Part three series. The following blogposts will be significantly longer and more complex hereafter. VSAM, Virtual Storage Access Method, is used as an access method to manage verious user data types. VSAM is a high performance data set type and popular for storing critical data. 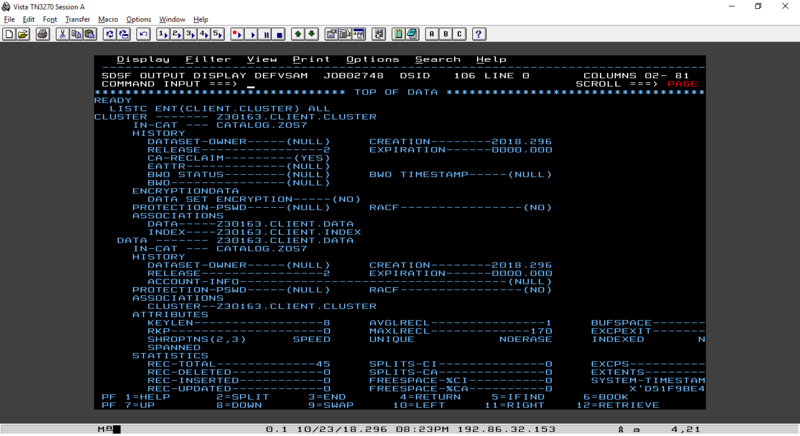 This challenge is about defining a VSAM KSDS and load client data from a sequential data set. If you’re interested, then you can either read IBM’s redbook or read this VSAM tutorial to know more about VSAM. BUT! It is required to read about KSDS before attempting this challenge. We need to create the data structure above. Let’s go! Let’s edit Z30163.JCL(defvsam). SYSTSPRT looks okay, now just copy to P3.OUTPUT(#06) and I’m done! I thought this would only take me 15 minutes or so. Sadly, I was wrong. It took me about an hour and a half. Next challenge is very long, seriously! Next up, DB2 relational databases! I’ll probably do challenge 07 and 08 this weekend. Expect the longest blogpost ever! I’ll be sure to contact guinsess worlds records. What took you longer than expected? This is a common issue throughout the challenge, it just means the disk is full. You might want to ask an IBM employee for help via mail or on their dedicated Slack channel (fastest medium). They need to free up some space. You can contact them on the following urls: https://masterthemainframe18.slack.com/, mail to zskills@us.ibm.com or https://www.facebook.com/MasterTheMainframe. I personally use their Slack to solve issues like this. Tell me please did i have correctly replaced values: INDEXED RECSZ(170 170) KEYS(8 0) ? I can’t access the system right now but I think that looks right. If you’re not getting the results you want, then you could try KEY(8,0) instead of KEYS. Don’t forget the commas. I tried different solutions, but I always get the error I wrote about above. Please change the VOLUME from VOLUME(VPWRKD) to VOLUME(VPWRKC) on line 000080.
ksds is the only dependencies required here?